Interested in learning a skillset that will provide new opportunities for applying new ideas and implementing those ideas into commercial and residential projects, such as plumbing, heating and cooling? Then consider the Camblin Apprenticeship Program – which provides on the job training while you earn your education. The four year apprenticeship requires 400 hours of class training, 176 hours of online training and 8000 hours of on the job training. Classes are held during the work day, one day a week for 10 weeks each year. Camblin Mechanical, Inc. pays for the tuition cost of classes and apprentices in return work for Camblin. 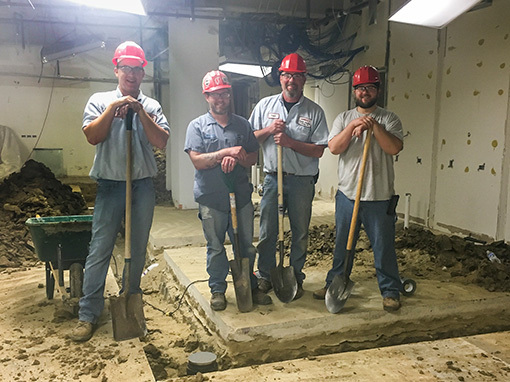 Upon completion of the program apprentices are eligible to sit for the Iowa Journeyman Plumbing exam, and once passed, will be able to apply for their Journeyman Plumbing license from the state. Since Camblin pays the cost, you get a four year education with no debt and earn a living at the same time! Once you are licensed through the program you are eligible to sit for HVAC, Refrigeration and Hydronics without participating in another apprentice program for each discipline. All you need to do is study and take the test. Take the next step and fill out an application! We hope you like what you’ve heard and are excited to apply. We look forward to hearing from you!